I recognize that just about every dip since March 2009 has been a screaming buy. Since that date the market rallied over 100% and decimated short sellers at every turn along the way. If fact, the market got so efficient at killing shorts that they should probably be classified as an endangered species today. But there are a number of signs that suggest to me that today's "pullback" may be different. Less than two weeks ago fund manager Whitney Tilson covered his high profile short in Netflix and sent a letter to investors vowing to stop shorting similar stocks in the future. And there are a bunch of floor traders I've seen interviewed on CNBC recently that have been bearish since 2009 and have just recently turned bullish. Earlier this month I heard more than one of these guys saying something like "everyone knows me as being a long term bear, but as of today I am now bullish stocks". Really? You were a bear as the market moved almost 100% against you, and now you want to buy? Are there any real bears left out there? Does this not feel an awful lot like the dot.com top in 2000? I have been particularly nervous about this market over the past week or so. Scanning charts is a nightly ritual for me. I do this every night to look for potential setups and trade ideas for the coming days. But over the past week, while the overall markets continued to march higher, many individual stocks have been showing (some screaming) warning signs. Gap downs, bearish engulfing candles, bearish momentum divergences and slow grinds below short-term indicators like the 20 day moving average. I tweet all of my trades on twitter, so those who follow me know I have been actively cutting back long positions over the past week. Names like AAPL, AIXG, HK, TBT to name a few. However, while I sold off individual names, I was reluctant to short the S&P outright as, quite frankly, it just kept going up. As well, I have been patiently waiting for a "melt up". That one day, where the Dow rallies 200-300 points, as the final denier throws in the towel and goes long stocks. To me that would signal the "all safe" sign to jump in and short the S&P 500. 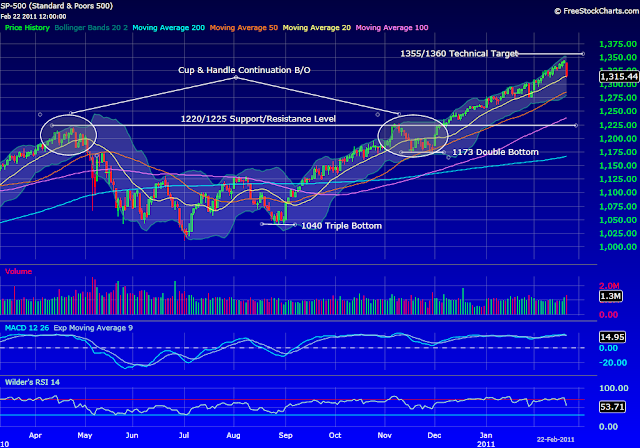 From a technical perspective I have been eying the 1355/1360 level as a possible top. In the meantime, in addition to cutting back longs, I have been getting long gold (Time To Go Long Gold Again? ), shorting EUR/USD (EUR/USD - Short Trade Back In Play) and shorting Brazil stocks via the EWZ (The Short On Brazil). Not all of these have gone my way yet. In fact only the gold strategy is currently in the money. But these are longer-term strategic plays and I am willing to give them more room to work than my typical trades. And I also look at all of these as proxy-hedges against an overheated US stock market. The idea being that each of these strategies have merit in their own right, but would likely perform even better should the US stock market start to stumble. There are other reasons to be concerned here. We are getting close to the spring where "Sell in May and go away" may come into play. In fact, we could start to see people attempt to pre-empt the May selling and start selling in March/April ahead of that period. And everyone knows that Joe Retail Investor missed much of the last 100% rally. This Feb-Apr period could see the remaining retail investors on the sidelines finally jump into the market as deadlines for IRA and RRSP contributions approach. After this final bout of buying I have to wonder where the next round of buyers are going to come from. I can't say with certainty that today marks the near-term top in US equities. It is entirely possible that we still get that one last melt-up and test 1355/1360 in the S&P500 over the next few days/weeks. And I'm still holding a small handful of longs (like SIO.V and SNE) regardless of my overall market view. But there are too many warning signs out there and risk/reward does not favour aggressively buying dips here.